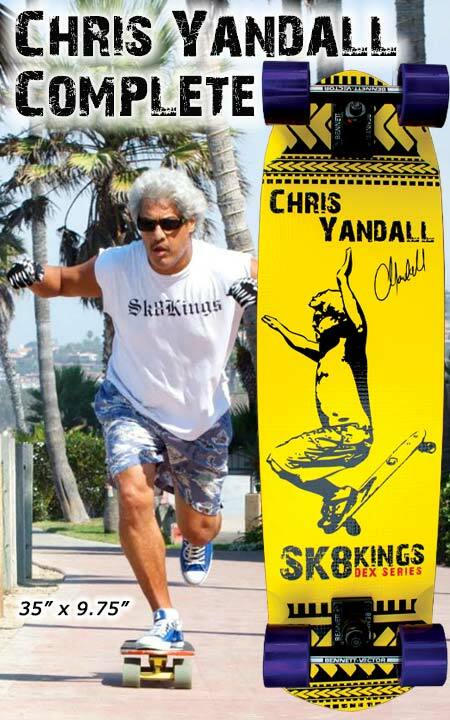 Sk8kings: LONGBOARD / SKOG / LDP / CRUISER COMPLETE -- CHRIS YANDALL LEGEND MODEL - 35" X 9.75"
Honoring the memory of our dear friend and team rider Chris Yandall (1954-2014)-- Sk8Kings has reissued this limited edition collector deck/complete. Order your Chris Yandall Complete ready to roll right out of the box. Fully loaded with select quality components -- this complete build is ready to rip up any terrain -- from the boardwalk to bombing garages. The deck is perfectly sized at 35" x 9 ¾” and made from Canadian hard rock maple with Fibre Lam composites. The deck features wheel wells all around and a super comfortable wide flat platform to traverse the miles on. The flat design promotes stability when alternating pushing foot and occassionally pumping switch stance. This also allows the long distance rider to build more symmetry in both left and right side leg and back muscles for an all around balanced workout. 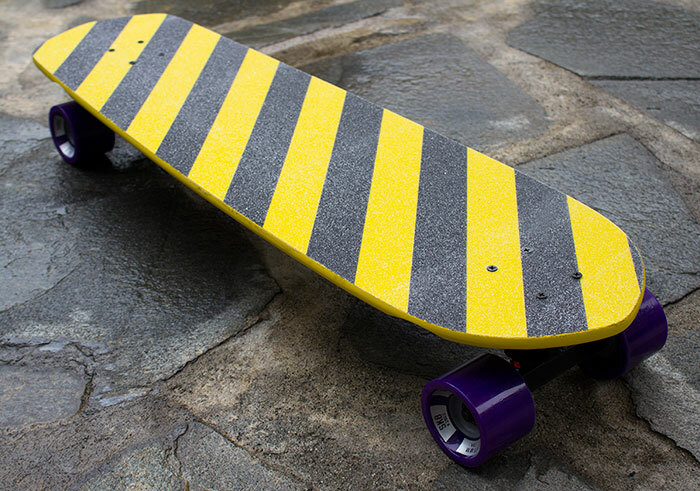 At the very least it can be one of the most fun longboards you will ever ride. Not only will this board take you everywhere -- but you can take it everywhere too -- sized at 35" it will fit in most standard size skate bags. CUSTOM BUILT FOR YOU: Please specify rider weight when placing your order so we can dial the setup accordingly. Setup notes from Chris Yandall: I like a lot of turn up front and stability in the back which is what my board off the sales shelf does. Any board that can at least do that rocks in my skogging world. I need room to place both feet on the board. Any more than that is extraneous! DECK SPECS: Overall dimensions: 35" x 9.75" with 23.25" WB. Features: Flat non-cambered composite construction in stiff flex. Hand-crafted entirely in Southern California using the latest Fibre Lam construction. Screened with Samoan Warrior Tattoo graphic in Yandall Yellow colorway. OPTIONAL UPGRADES: High Performance Trucks: Choose from the list at checkout to upgrade for the ultimate set-up to suit your budget. Wheels: Choose from the list at checkout to upgrade wheels & make special durometer requests in the "NOTES" section if needed. Premium Bushings: Upgrade to premium grade custom bushing combos all around. Back-up Bushings: Bushings are essential for top performance. Order backup sets for your trucks and be ready when you need to be. Choose "premium" for this upgrade if you have also upgraded to premium bushings. Bearing Upgrade: Choose from the list at checkout to upgrade for the ultimate set-up to suit your budget. Oust Bearing Maintenance Bundle: Includes one bottle of Oust Metol Speed Lube and one Oust Speed Kleen Bearing Wash Kit at a special bundle price savings. Remove dirt and buildup from bearings with the Kleen Kit and relube with Metol Speed lube. Choose upgrades when ordering -- additional charges apply. Custom Stripe Grip Top --available. Choose from Glow in the Dark stripe or Red & Black stripe when ordering.